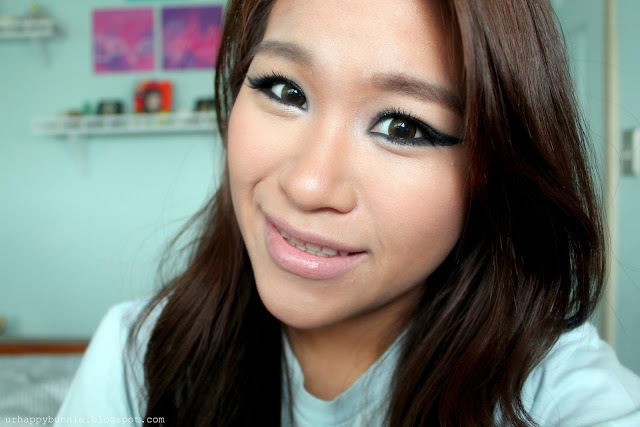 Here I am with another circle lens review, this time featuring GEO Fresh Circle Lens in brown. I've always been partial to gray and brown colored circle lens because I think those color suit me the best. This circle lens has 14mm in diameter but it doesn't really give me a bigger eye effect unlike other circle lenses of the same size. However, I find that this doesn't particularly matter to me because it still made my overall look really good. This particular lens should appear darker from afar and lighter in close proximity of the person wearing it, however I find it quite the opposite in my case. As you can see in my picture above, it the color appears lighter and in the bottom, close up picture, it appears darker. Whatever the case may be, this adds a very warm and subtle enhancement for my eye. My eyes are naturally brown and I think this enhances my natural eye color which is brown. I think this is the most natural brown circle lens that I have ever encountered. I can never reiterate how comfortable circle lenses are and I usually wear them for 8 hours or more. My eyes are not particularly sensitive so I have no problem wearing contact lenses. I'll give this a 9/10 rating mainly because it remains true to its name: Fresh. The look this gives with little or no makeup at all is really fresh and vibrant and oozing with life. Thank you. Contrary to that my skin and makeup for this post is really not at it's best.